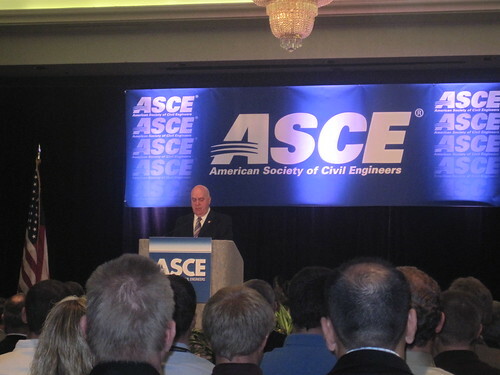 The opening session of the ASCE Annual Conference began with a wake-up call to all in attendance. Wayne Klotz declared, “modern society cannot exist without infrastructure,” in his final presentation to the society as President. The mega-cities in which we live are fueled by a constant intake of water, food and energy. These resources must travel fantastic distances and undergo many purifying processes. Civil engineers are the stewards of this high speed conduit. We should be self-aware and proud of the vital importance of our profession. Wayne urged the incoming leadership and all in attendance to embrace the ABCs of ASCE: advocate for, believe in and commit to advancing the profession and protecting the nation’s infrastructure. The importance of advocacy was driven home by Jim Suttle, professional engineer and mayor Omaha. 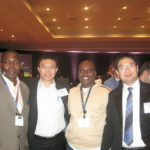 He reminded us that the qualities of successful engineers are necessary to face the problems of the day. There is a need in policy development for analytical evaluation of facts. Engineers also serve as a model for politicians when applying an ethical reverence for the public health and safety. Finally, we were reminded that engineers who engage in the political process succeed by tailoring their practices to the political realities of government decision making. In short, we all lose when engineers shy away from advocacy and the public debate. Later, Eric Peterson, representing a Washinton, D.C. think tank for strategic international studies, gave a litany of reasons why engineers must recommit themselves to solving societal problems. Or in Wayne’s words, “building our way out of the problem.” Eric’s main points did not specifically call out engineers, but we can read between the lines to find areas requiring engineered solutions. He isolated seven drivers of massive social change by 2025: 1) population trends, 2) resource allocation, 3) technology, 4) knowledge distribution, 5) global economic integration, 6) conflict and 7) governance. The first three points speak directly to infrastructure upgrades and maintenance. How do you support 6.8 billion people, and rising at a rate of 152 people per minute, disproportionately concentrated in large urban centers? What infrastructure changes will be required when the aged population exceeds the youth? Will it be possible to transport more resources farther and by sustainable means? What opportunities are opened when micro computing provides a chip capable of running a thousand thousand trillion processes per second (that’s not a typo)? Looking deeper down the list, we’re confronted with questions like the one posed by Thomas Friedman, “is it better to be a B student in Bethesda or a genius in Banglore?” In the flat world, historic geographical, political and socio-economic barriers matter less. How will America compete with the rapidly growing economies of Brasil, Russia, India and China (the BRIC nations)? Are they more committed to growing and modernizing their infrastructure than the US? Eric didn’t offer many solutions to these questions. He admittedly took the easy way out and declared that the world of the future would be one of great potential and great peril. Which ever side of the coin we fall on might well depend on how much we believe in the ABCs of the profession.